Chuck Grossman’s vocals are smoothly tempered from a lifetime immersed in song. His fingers, calloused from years of playing, seemingly float across his guitar strings, making the difficult progressions look far easier than they are. But that’s not what makes him a rock star. The Leadville, Colo. native, an extreme rock climber of more than four decades, has more than 200 first ascents. As a Leadville baby and one of the babies in a study on the effects of high altitude on newborns, Grossman jokes, “I was high since I was a child.” His dad was a mining engineer for Amax’s Climax mine in Leadville, but Chuck points out that he’s not entirely in favor of or against mining. “If it could be done environmentally responsibly then I’m not against it, but it seldom is.” His mother was a grade school teacher and second-generation Coloradoan. When his parents moved him to south Denver, Littleton, the pavement ended and dirt roads were just beyond their house. Chuck grew up watching the area transition from almost rural to congested shopping malls and subdivisions. But back when he was a kid, the open fields were his playground. Chuck learned to love the outdoors, with skis slapped on as soon as he could stand upright on two legs. The summer of 1978, following his high school graduation, he moved to Carbondale so he could have easy access to Glenwood Canyon. “I had seen that canyon when I was a kid and was very impressed,” he says of the spectacular geology of Glenwood before I-70 was run down the canyon’s middle. Throughout high school, you could find the young teen on the slopes with junior ski patrol at Winter Park. After his stint climbing around Glenwood Canyon, he actually moved to Winter Park to be a ski bum, paying a mere $50 a month rent and living the dream. When winter snows receded, he followed the rock, moving to Estes Park to climb. He laughs, recalling the once-popular bumper sticker that touted, “Ski Western State and pick up a diploma in your spare time.” Which is exactly what he did, setting up his schedule to maximize his time on the slopes and on the rock. In an epic climb in 1981 with Jim Newberry (a Cimarron native and climbing legend with first ascents in the Black Canyon), Grossman made an attempt on a new route in the Black Canyon that eventually became known as Astrodog. “Named for the dog we had found at the bottom of the cliff, who chased a chipmunk off the edge. We spent three days on the wall, climbing seriously overhanging rock. It was at the end of the third day, we were just approaching the first ledge, a thousand feet up, where we were going to spend the night, when rockfall occurred from a thousand feet above us. It rained refrigerator-sized blocks of rocks, hitting the ledge above us that we were going for and bouncing over and around us. If we had been on this ledge, I wouldn’t be telling this story. We set up a hanging tent below the ledge and continuously through the night heard rockfall that terrified us.” After that sleepless night, they decided wisely to bail and not attempt the final part of the climb. Chuck guided climbing for Wind River Mountain Guides of Pinedale, Wyo., during the summers, and he recalls how difficult is was after the terrifying rockfall experience in the Black Canyon, but he also felt it was somewhat therapeutic. He graduated from WSC in 1984 with a bachelor of arts degree in business administration and moved to Fort Collins. He chortles that he’s still playing bars and ski towns. In high school, he was a prolific song writer. 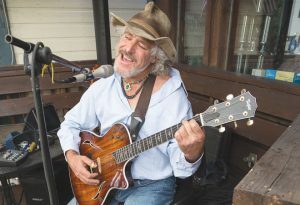 While attending WSC, Chuck played local Gunnison and Crested Butte venues, doing his blend of folk rock, blues, and country covers as well as his originals. At the end of his tour of Euro pubs, he returned to the U.S. in 1988, and it was while jamming at the Mountain Man Rendezvous up Washington Gulch that he met Monique Nyskens. They married shortly after and moved frequently to follow work and dreams—Redstone, Nederland, Eldora and in the early ‘90s, they moved to Monique’s homeland, Holland, living in a 16th-century farmhouse near the borders of Belgium and Germany. Chuck was playing finger-style blues gigs in the Netherlands, Germany and Belgium. A year later, they returned once again to Eldora where Chuck recorded his first CD, Burnin’ Blue, released in 1999. They toured the west coast and into Texas promoting his CD, living out of a camper bus, and realizing that trying to make a living playing music on the road was difficult, so they returned to Eldora in 2000. The couple decided to go their separate ways the following year and Chuck bought a house in Leadville, closer to the better-paying gigs in the Vail valley. His talent scored him a steady show at the Ritz-Carlton at Beaver Creek, and he put a thousand miles a week on his car between various ski towns. He was later booked at the new Lake Tahoe Ritz-Carlton, doing shows there for a couple of years. When Chuck’s father was diagnosed with Parkinson’s in 2012, he moved back to Denver to help care for him, doing gigs at the Denver Ritz-Carlton and other venues for the next several years. His father passed away in early 2013. Chuck felt somewhat directionless and homeless, and went traveling throughout Colorado. He rekindled his interest in climbing through his statewide sojourn, winding up in Paonia where a life-altering, serious car accident served as a wake-up call. “It scared me and made me realize how tenuous life can be.” With most of his gigs in Crested Butte, he decided to relocate in 2014. Recently Chuck recorded a couple of songs for the legendary mountaineer Jeff Lowe’s Metanoia, a film recounting his epic solo ascent of the Eiger and his subsequent battle with a debilitating disease, a form of ALS. The movie has won 17 international film festival awards. Grossman has landed steady gigs and regular shows in many venues and events up and down the valley.